built for his father received local acclaim for its high quality and innovation. The fledgling fabricating company grew rapidly from a home-based operation in Conestogo to a 7000 sqr ft facility in St Jacobs where international recognition resulted in orders from buyers as far away as Holland and Israel. production lines to keep up with demand. Soon after, the company embarked on the manufacture of aluminum & steel dump bodies under the C-Max Transportation Equip. name. These dump bodies gained immediate praise for their durability and superior design - again necessitating a large expansion of staff and manufacturing space. In 1988 the first Fire Truck was engineered, built and purchased by the Floradale Volunteer Fire Dept. On January 1, 1990, C-Max Transportation Equip was registered and continued to manufacture dump bodies, trailers and fire trucks. By 2001, C-Max had manufactured 64 Fire Trucks including Pumpers, Rescue Vans & Tankers. On May 1, 2001 Weber’s Fabricating (under the name C-Max Transportation Equip) became Superior Fire Truck’s first ever standalone Service Center to provide warranty service for their Fire & Rescue Group. C-Max eventually shifted their focus to post sales support, preventative maintenance packages, standards testing, training, warranty service, parts installation and repairs to all makes and models. The company prides itself on delivering exceptional customer service supported by a highly skilled staff of certified technicians, mobile testing labs, training instructors, a complete metal fabricating facility and paint & body operation. In Jan 2010, the name was refined to "C-Max Fire Solutions" and has become one of the major fire service companies in the province of Ontario. 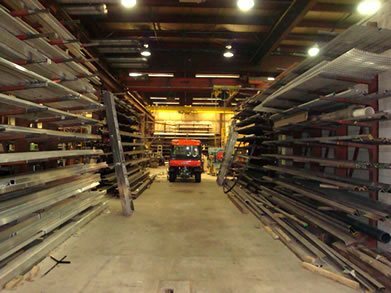 We have firmly established ourselves as a reliable custom metal fabricator, providing quality products and service for Commercial, Industrial and Farm applications. We take pride in providing our customers with exceptional service, taking your idea from paper to fruition with attention to detail and workmanship and it is still run as a family owned business. In the midst of many changes, one thing that has stayed the same is Clare’s philosophy of providing a good product for a fair price. “The best form of advertising is the last customer that drove out the driveway. If he’s happy, he’s going to tell somebody”.